Crime at schools located outside of Fort Collins are indicated on the Larimer County Sheriff Office’s online crime mapping tool at Raidsonline.com. The interactive map is a no-cost service provided by Bair Analytics based in Highlands Ranch. Bair collects the data from Larimer County and turns the department’s calls for service into pinpoints on a map. 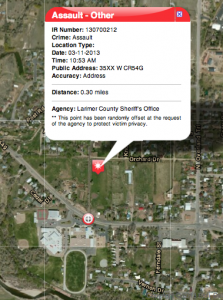 A March 11, 2013 assault — a potential violent crime — that occurred at 10:53 a.m. is mapped about 1/3 mile north of Cache la Poudre Elementary along Orchard Drive and labeled: “Assault – Other”. Raidsonline.com describes the Assault – Other label as “the act of causing or attempting to cause bodily harm upon another individual.” The address of the assault is listed as 35XX W. County Road 54G in LaPorte. Cache La Poudre Elementary and Cache La Poudre Middle School share a campus in the 3500-block of W. County Road 54G. A mobile home park to the east is also in the 3500-block. Through Colorado Open Records Act requests, North Forty News in November began asking the Larimer County Sheriff’s Office for a list of the agency’s logged calls for service to the two schools between Jan. 1 and Nov. 21, 2013. At no time did the North Forty News ask for the identity of those involved in incidences or crimes. The two lists — one for each school — contained 256 calls, with the majority (196) being routine patrols known as community policing or directed patrol. The lists also contained incidents serious enough to require reports — two assaults, four thefts and five harassment reports. The two lists also contained five calls to the schools that were redacted (blacked out) so that the calls for service information — call number, case number, dispatch date, call type, location and responding unit ID — could not be read. North Forty News then followed up with CORA requests asking what public interest would be compromised by release of the information. Later that week the sheriff’s office released the unredacted calls for service to the CLP schools, noting that the information had already been listed in the online LCSO incident blotter updated daily at larimersheriff.org. The redacted items were labeled “Juvenile Problem,” and were incidents that deputies did not file written reports on. Staff at CLP Elementary in LaPorte called 911 for a violent student or students at the school on at least two occasions in 2013 and once in 2014. On Nov. 13, 2013, LCSO deputies responded to a student who was acting violently and throwing school property. The student was isolated in a classroom until deputies could arrive. Prior to that, deputies were called during school hours to deal with a student next to or in traffic on County Road 54G, the thoroughfare that runs in front of the school. No LCSO reports were issued for these three incidents involving the violent student behavior, although each incident was listed for one week as a “Juvenile Problem” in the LCSO’s online incident blotter after which a parent or citizen would need to do a CORA request to get the list of calls. Subsequent CORA records requests to LCSO for 13 other reported incidents at the CLP schools — assaults, harassments and thefts — resulted in little information. Spindler said it would take a court order to release the reports the North Forty News requested. The five reports that were released detailed a stolen iPod, a family dispute, a stolen bike and a report of graffiti at the schools.